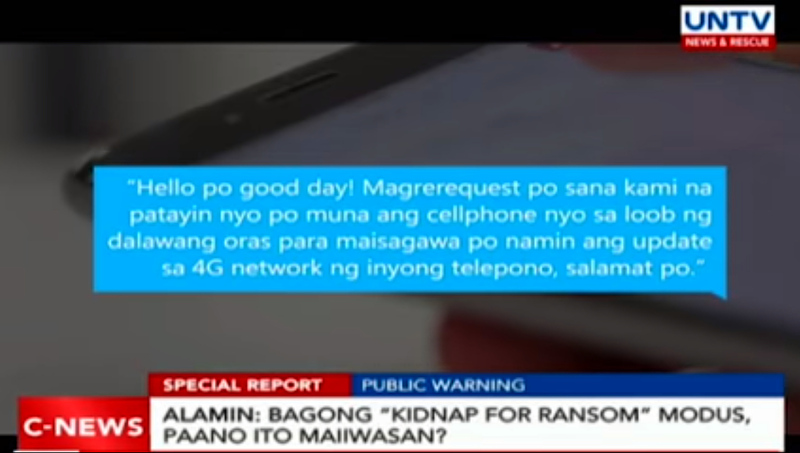 The Filipino public is advised to be vigilant about a new Tech-Related "Kidnap for Ransom" Modus Operandi that at least one nefarious syndicate is currently using to extort or steal money from their hapless victims coming into this year's Yuletide Season. 1. The victim receives a call or a text message from an unknown number requesting if he or she could turn off his or her smartphone for two hours so the device could receive a "4G Network Upgrade". The message usually goes like this: "Hello po good day! Magrerequest po sana kami na patayin nyo po muna ang cellphone nyo sa loob ng dalawang oras para maisagawa po namin ang update sa 4G network ng inyong telepono, salamat po." 2. Believing that the notification is legitimate, the victim will indeed turn off his or her handset. 3. Within that span of two hours, the criminals will get in touch with close relatives, parents, or siblings of the smartphone owner and tell them their loved one has been kidnapped. This is usually done through landline or cellphone calls with voice actors mimicking the sound of a victim asking for help in the background. This proves that even before sending fake 4G notifications, the syndicate has already studied their victims and has gotten the contact details of their immediate family. 4. The criminals will then ask the family of the victim to drop off a certain amount of money in some location before they release their fake abductee. 5. Since the victim's mobile device has been turned off, there's usually no way for relatives to confirm if he or she has indeed been kidnapped, making the calls of the criminals sound real and scary. 1. Always make your loved ones aware of your whereabouts. 2. Leave an alternative or emergency contact number in case they can't get in touch with you through your main number. 3. Don't easily believe calls or texts by people you don't know. Criminals are becoming more crafty by the day. 4. Know that our country's largest networks, Smart Communications and Globe Telecom, will never require you to turn off your smartphone for the device to get a 4G Network Upgrade. 5. Inform the police in the event that you receive suspicious calls and texts. Finally, don't forget to let your family, friends, and loved ones know that this modus operandi exists and that they should be aware of it. Take care, everyone!